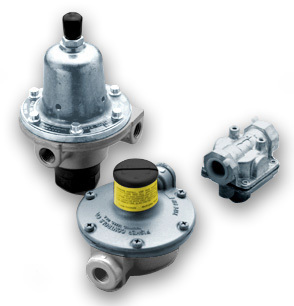 Propane pressure regulators are one of the most important parts of a propane gas system. The purpose of the regulator valve is to control the flow of gas and to lower the pressure from the tank to the appliance(s) in the gas system. The regulator not only acts as a control regarding the flow and distribution of propane but also as a safety barrier between the high pressure of the tank and the end use appliance(s). Some may argue that the LP Gas regulator is the heart of any propane gas system. Making sure the regulator is properly installed and regularly maintained is of utmost important. 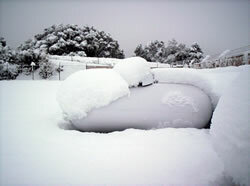 (From gas, hoses, and regulators .com) – Pressure in a propane tank, large or small, can range between 100 and 200 psi. This propane pressure must be reduced and regulated for use in a home, motor home, camper, or an outdoor gas appliance. Typically, a residential application will require a low pressure regulator which reduces the gas pressure to 6 ounces (10.5 inches water column). This low pressure regulator will be located on or near the main tank supplying gas to the home, motor home, or camper. Outdoor gas appliances may access low pressure propane gas through a gas convenience outlet located somewhere after the low pressure regulator or from a separate, portable tank like the kind you see at Home Depot or Lowes. Portable tanks also require propane pressure regulation. Sometimes a low pressure regulator is built directly into the gas appliance and sometimes one must be installed on the portable tank itself. Check with your gas appliance manufacturer to see what propane pressure the appliance requires at the inlet on the gas appliance. Some outdoor gas appliances, such as high heat cast iron burners, require the use of a high pressure regulator because they need more volume of gas than a low pressure regulator will deliver. A high pressure regulator will regulate the output pressure from 1 psi to as high as 60 psi. There are a number of different high pressure regulators available. Some high pressure regulators are “preset”. That is, the propane pressure is fixed at, for example, 10 psi or 20 psi. Further attenuation of the gas delivered to the appliance may be done by use of an inline ball valve or needle control valve located either on the hose or built into the appliance. The other common type of high pressure regulator is an “adjustable” high pressure regulator. Adjustable high pressure regulators are available in 0-20 psi, 0-30 psi, and 0-60 psi versions and have an output pressure adjustment control built directly into the regulator. Depending on the number of btu/hr that the gas appliance(s) require, one chooses the adjustable propane gas regulator which gives the required number of btu/hr. Choose the propane regulator that is the closest match. There is no advantage of having a propane regulator with a lot more btu/hr than you actually need. As you increase the btu/hr output of a propane regulator, the degree of control that the internal propane regulator valve has over the gas output decreases; i.e., turning the valve an 1/8″ in a 0-60 psi adjustable propane regulator has a lot more effect than turning the valve an 1/8″ in a 0-20 psi adjustable propane regulator. Folks frequently ask: “How long will my portable tank of propane last?” This is easy to figure out if you know the number of pounds of gas that is in your full tank and the btu/hr demand of your burner or other gas appliance. One pound of liquid gas in your tank has 21,591 btu/hr fuel value. The most common tank is a 20 pound tank (also sometimes referred to as a 5 gallon tank). This is the kind of portable tank you would find at a Home Depot, Lowes, etc. If you have a low pressure burner, for example, that is rated at 40,000 btu/hr maximum output then you can run that burner at full blast for 10.8 hours: (20# x 21,591btu/# = 431,820 btu is the gas in a 20# tank, 431,820 btu ÷ 40,000 btu/hr = 10.8 hrs) . On the other hand if you have a high heat, high pressure burner that is rated at 160,000 btu/hr maximum output you can run that burner at full blast for only 2.7 hours. In practice, it is unusual for anyone to run a burner at full throttle for that long so you will probably not empty the tank this quickly. The point is that if you want to develop the heat in an uninterrupted manner you have to plan for adequate propane tank reserves. Experienced chefs keep a spare propane tank around. These figures are theoretical. According to a major 20 pound propane tank producer, Blue Rhino, their 20 pound propane tank will only contain about 4.1 gallons of liquid propane which weighs just 17 pounds. The empty propane tank weighs about 20 pounds so if you add the 17 pounds of gas you have a full propane tank weighing around 37 pounds.“My propane regulator is icing up and the propane output is dropping”. One of the common complaints I hear is: “My propane regulator is icing up and the propane output is dropping”. A single stage, high pressure regulator will expand the volume of the gas from a liquid state to a gas just before the point that the gas hose is attached to the propane regulator output. That change of state from liquid to gas requires a considerable amount of heat. The heat comes from the metal that surrounds the gas in that area. If the demand for the propane is very high, the metal gets noticeably colder and colder because it can’t draw heat from the surrounding area fast enough. If the demand for gas is very high and there happens to be a high moisture content within the propane stored in the tank, the water vapor can condense and freeze up internally within the regulator (a cold metal enclosure) thereby block the flow of the propane to the supply hose. What can you do? USE A HEATED POWERBLANKET CYLINDER WRAP: www.powerblanket.com …. or you can complain to your retail gas supplier. Ask them to purchase the gas from the gas wholesaler that will inject some methyl alcohol into the propane…methyl alcohol acts as an antifreeze. This might help a little, but our experience shows using a powerblanket cylinder wrap is much more reliable and efficient! Folks also ask: “What is a btu?” A btu, or British Thermal Unit, is the amount of energy required to raise one pound of water one degree Fahrenheit. A gallon of liquid propane contains 91,502 btu’s. A pound of liquid propane contains 21,591 btu’s.